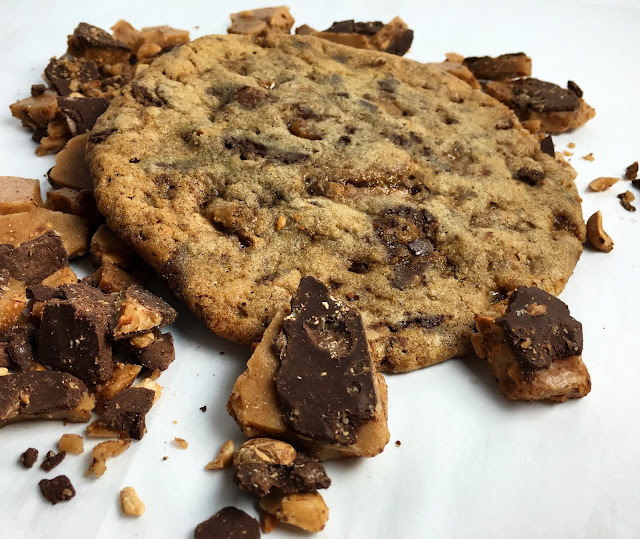 What do you get when you add amazing homemade Butter Toffee to an already winning Cookie? Why, if it's not some absolutely insane Butter Toffee Cookies that are as much circular Candy Bars as they are actual cookies. 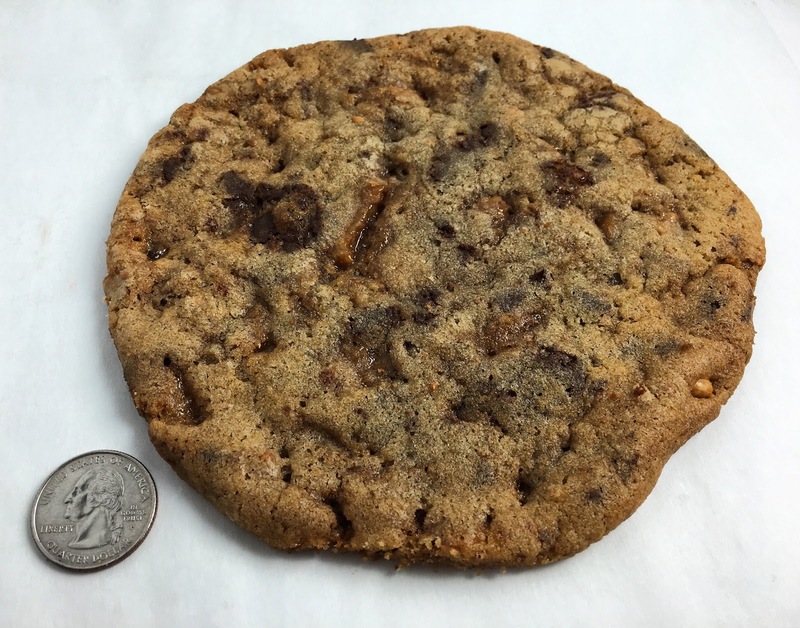 What do you get when you make them each of those Cookies a quarter pound in size? There are big cookies, and then there are BIG cookies. Coming in at 115g each, these quarter-pounder Butter Toffee Cookies are no joke. Those seeking portion control should look elsewhere. Just look at how small they make George Washington look! In terms of style, these Butter Toffee Cookies are extremely chewy (but not "fudgy") and flatter. The mixing process is a straight-forward creaming method: Sugars & Butters + Eggs + Dry Ingredients. The recipe calls for both White Granulated Sugar and Brown Sugar. The White Granulated Sugar helps create those crispy edges. Brown Sugar, which is more hydroscopic (i.e. it attracts moisture), brings a richer flavor and increases tenderness. The relatively high proportion of Brown Sugar also increases the spread (i.e. 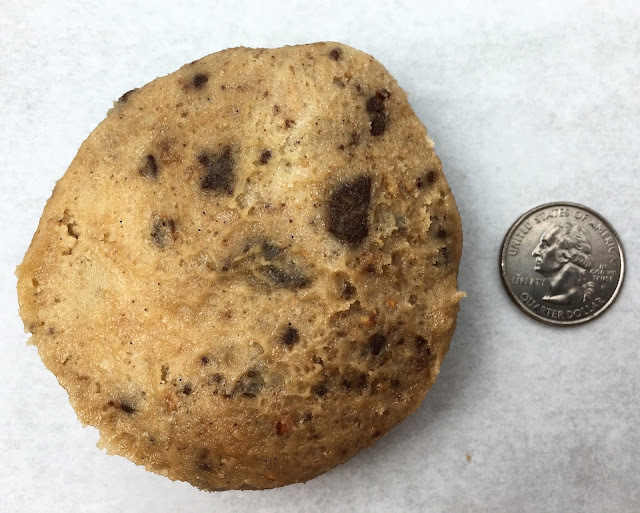 how wide and flat the Cookie becomes). To offset some of the spread (so as not to have totally flat, lace-style cookies), the recipe also calls for a combination of Bread Flour and All Purpose Flour. Bread Flour has a higher protein content and provides more structure as gluten develops. 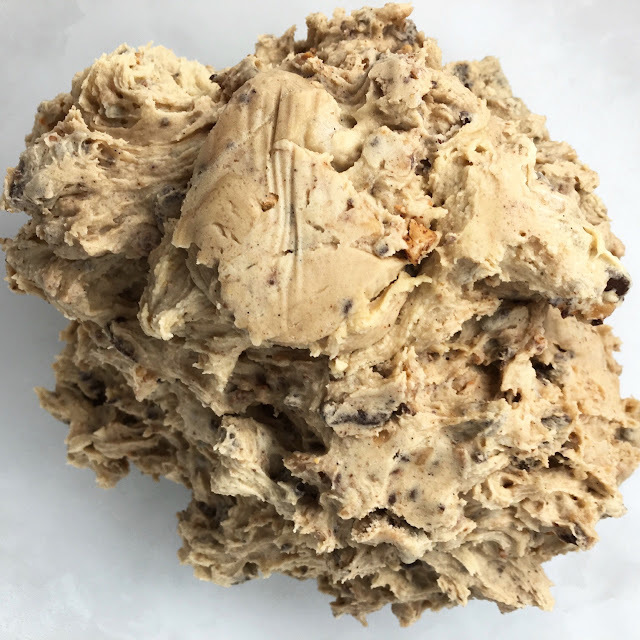 As a final note, the Butter Toffee Cookie Dough works best if it is rested and chilled for at least four hours (ideally overnight) before it is portioned and baked. The resting period gives the ingredients time to come together, and it develops flavor. The chilling makes the Cookie Dough easier to portion, and it slightly reduces the final spread in the oven. It is very important to leave ample room between each portion. Do not try to fit more than four portions on a half sheet tray (18"x13"). Because of their large size, it is necessary to bake the Butter Toffee Cookies at a lower temperature for a longer time. The lower temperature promotes even baking (no burnt edges and raw centers). After several tests, 300 degrees Fahrenheit (149 degrees Celsius) for 25-28 minutes worked best. 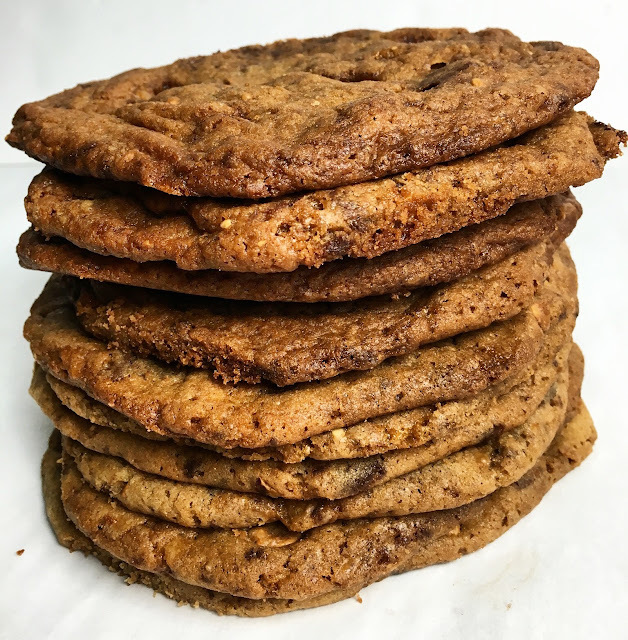 With so much Butter Toffee mixed into this dough, these Cookies are loaded with pockets of sweet, buttery goodness. When baked, some of the Butter Toffee melts into the dough, while larger pockets eventually re-harden into crunchy bites. The Butter Toffee Cookies will keep very well for up to a week in an airtight container at room temperature. The Cookies can also be frozen for several months in an airtight container. Allow the Cookies to temper to room temperature before serving. 1. In the bowl of an electric mixer fitted with a paddle attachment, cream the Butter, Brown Sugar and White Granulated Sugar until it is light and airy - approximately two to three minutes. Scrape down the bowl. 2. With the mixer on medium speed, add one Egg at a time to the Butter and Sugar mixture. Beat the Egg until it is fully incorporated and the mixture is once again light and airy. Add the second Egg and the Vanilla Extract, again beating the mixture until it is light and airy. Chef's Note: Do not worry about over-mixing at this stage. It is important to properly aerate the Butter and Sugars and to emulsify the Eggs. This mixing process traps air in the Cookie Dough, which is important for leavening. 3. In a separate mixing bowl, combine the Bread Flour, All Purpose Flour, Baking Soda, Baking Powder and Salt. Gently whisk the dry ingredients until they are well combined and evenly distributed. 4. With the mixer on low speed, add the dry ingredients to the wet ingredient in two incorporations. Add the second portion of dry ingredients while the mixture is still streaky. Stop mixing as soon as the ingredients are well combined. Do not over-mix. Scrape down the bowl. Chef's Note: Once the Flours have been added, mixing develops gluten. Over-mixing can result in an undesirable texture. 5. Break the Butter Toffee into small pieces - approximately 1/2" chunks. Add the Butter Toffee chunks to the mixer bowl and stir briefly on low speed until they are just incorporated. Cover the bowl with plastic wrap. Rest and chill the Butter Toffee Cookie Dough in the refrigerator for at least four hours (ideally overnight). 6. 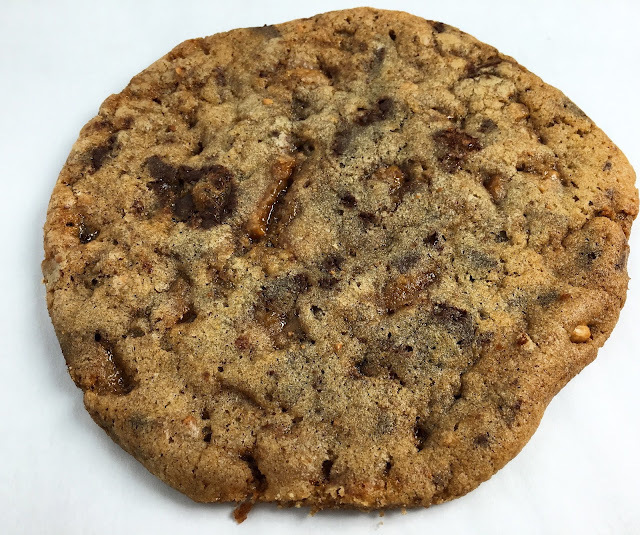 When the Butter Toffee Cookie Dough is rested, preheat the oven to 300 degrees Fahrenheit (149 degrees Celsius). Divide the dough into 115g (4 oz) portions. 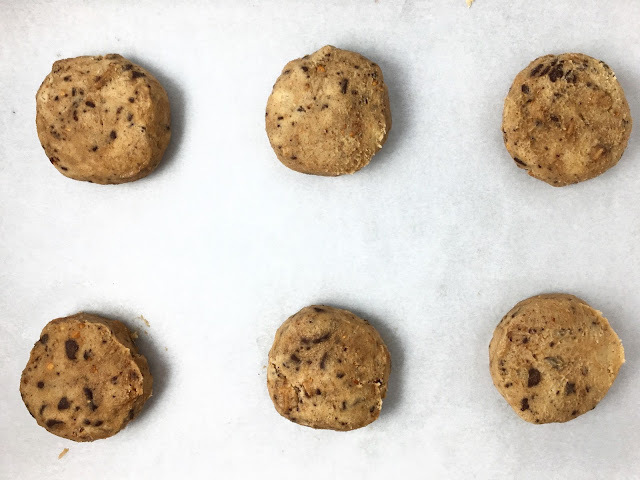 Gently roll each portion into a ball and place it on a parchment lined sheet tray, pressing down on the dough to gently flatten it onto the sheet tray. Leave several inches of space between each portion. Chef's Note: These Butter Toffee Cookies are very large and will spread significantly in the oven. Do not try to fit more than four portions on a half sheet tray (18"x13"). 7. Bake the Butter Toffee Cookies for 25-28 minutes, rotating the sheet tray half way through the bake time. The Butter Toffee Cookies are done when they are slightly crispy at the edges but still soft in the center. Remove the sheet tray from the oven and allow the Butter Toffee Cookies to cool for approximately 10 minutes before transferring them to a wire cooling rack. - The Butter Toffee Cookies will keep well for up to a week when stored in an airtight container at room temperature. - The Butter Toffee Cookies can be frozen for several months in an airtight container. Allow the Cookies to temper to room temperature before serving.